Breathe it in! Layered Mountain Views as far as the eye can see! AMAZING LONG RANGE MOUNTAIN VIEWS AT AN UNBEATABLE PRICE! Breath it in, because the air is as pure as the view. Bearly Roughing it is a luxury vacation cabin perched on a north Georgia mountain top near Blue Ridge, GA. Walking on to the covered deck you will be overwhelmed by the view! 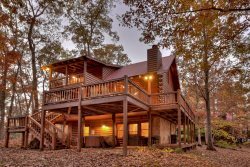 This cabin has long range mountain views of Georgia, Tennessee and North Carolina from every level. Inside this well-equipped vacation home you will find a large great room that is perfect for relaxing and entertaining. A well-stocked kitchen with everything you need including a breakfast bar with stools. The dining table seats six people and the plush living room furniture will keep you and your guest comfortable and relaxed. The living area has a 32-inch flat panel TV. The cabin is equipped with wireless internet and Dish TV satellite services. The master bedroom has a king bed and is located on the upper level with access to a private balcony with a swing is right off the master. The master bathroom has a double vanity and walk-in shower and jetted tub. The entry level bedroom has a queen bed and access to the main level porch. The bathroom is shared with the main level and has a tub shower combo. The lower level bedroom has a queen bedroom and shared bathroom with the game room. The lower level is perfect for entertaining, and feature a large game room area with a pool table, foosball table, and dart board. The living area on the lower level has a large section "L" shaped sofa and lots of board games and puzzles for your enjoyment. There is also a large 55-inch HD Flat Screen with Surround Sound, and a Blu Ray player. Outside living is fantastic at Bearly Roughing it. You will find ample seating and an outdoor fireplace on the covered porch. 6 Adirondack chairs and a 4 to 6 person hot tub on the lower level and a nice propane grill for cooking it up. Long range views, clean and comfortable... Everything you are looking for is right here! Located 15-20 minutes from downtown Blue Ridge shopping in Mineral Bluff. Upper-level master bedroom including a private bathroom with a stand-up shower, jetted tub, and double vanity. Private balcony with porch swing also included. Lower level covered deck has 6 Adirondack chairs and 4 -6 person hot tub. We were very impressed with the professionalism & knowledge of the staff. Check-in & check-out went smoothly. The phone call on the day after check-in was especially nice. We will definitely stay at this property again. We loved everything about it, from the decor to the small comforts (comfy chairs & lots of books, very comfortable beds, great game room, well-maintained hot tub) and felt very much at ease there. Its close to shopping & restaurants but far enough away for quiet & relaxation. I wouldnt change a thing about this cabin! The cabin was well-appointed, very clean and the game room offered many options - pool, foosball, darts, cards and many board games. There were so many decks - upstairs, downstairs, off each bedroom, you could have privacy or enjoy the outside fireplace and grill with friends while overlooking the treetops and gazing towards the mountains. Being on three levels, it might be a challenge for persons who don't like climbing stairs, but we loved it! Team members were excellent! We had issues with TV remote, and malfunctioning coffee pot and response was great. The cabin was wonderful, the road to get to it not so much. It limited our ability to come and go and visit places. Booking and Check-in was easy with friendly staff. Thank you for having pet friendly locations with great mountain views. Super friendly staff. The entire booking, check in, extending our stay and check out were fast and easy. The view alone makes Bearly Roughing It an amazing place to stay for your vacation. It was immaculate. The amenities were awesome - from the pool table, darts, outdoor and indoor fireplaces. So many great reasons to choose these accommodations. In fact, we ended up extending our stay 2 additional days. We did not want to leave! Our reason for visiting was for a relaxing vacation! Our stay at Bearly Roughing It was great. The view from the deck was perfect, you can watch the sun set behind the mountains every night. Two Car parking is optimal. Driveway is designed so that cars will park one behind each other. Turn around space is available at the driveway entrance.